1) The year-over-year increase in oil production of 75.5% in May was the largest annual gain in state history. 2) North Dakota produced 17% more oil than Alaska in May, marking the third consecutive month that North Dakota out-produced Alaska. The Peace Garden State surpassed Alaska’s oil production for the first time in March to become the country’s new No. 2 oil state, behind only Texas. 3) The number of producing oil wells in the state increased to a new record high of nearly 7,000, and more than 216 new wells were added in just the last month, which is the second highest monthly increase on record. As I reported earlier this week, each new oil well is the equivalent of adding a new $8-10 million business to the state economy, see recent CD post for more details. 4) The amount of oil produced per oil well in the state increased to a new record high of 92 barrels per day, an increase of 35% compared to a year ago, and a sign that the efficiency of shale oil production is increasing significantly. Both the increasing number of wells and the increasing output per well is contributing to record high production levels. As a result of the ongoing oil boom in the Bakken area, North Dakota continues to lead the nation with the lowest state unemployment rate at a four-year low of 3.0% in May, and more than five percentage points below the national average of 8.2%. There were ten North Dakota counties with jobless rates below 2.0% in May, and Williams County, which is at the center of the Bakken oil boom, boasts the lowest county jobless rate in the country at just 0.7%. The exponential growth in North Dakota oil production has fueled exponential growth in the state’s “Natural Resources and Mining” employment, which has tripled in less than three years, and reached more than 22,000 in May. Bottom Line: The ongoing record-setting oil production in North Dakota continues to make it the most economically successful state in the country, with record levels of employment and income growth, a labor shortage, increasing tax revenues, the lowest foreclosure rate in the country, a strong real estate market, and jobless rates in ten counties of the Bakken region below 2.0%. Call it the “Dakota Model” of job creation and economic prosperity that is based on developing America’s vast energy resources, which is an economic model that could easily be replicated elsewhere if more domestic energy resources were opened up to exploration and drilling. 7,000 mostly new wells and only 640,000 barrels of production? At $10 million a pop why is this considered a success for the producers? It gets funnier and funnier reading VangeIV every day. "Great for ND workers but nothing meaningful for the global oil supply picture. You seem to get excited about production of 330K barrels per day when that is rounding error in the daily usage number for the US. And what is so great about $10 million wells that produce an average of 80 barrels per day after a year of production?" So now that it's producing almost 640,000 bpd 2 years later he's still desperately trying to minimize its importance! It may well be, VangelIV, that you have stumbled upon some obscure economic principle that proves your point. But it is hard to imagine that so many companies have been willing -- over so many years -- to commit capital to such a foolish endeavor. Stranger things have happened, though. And when it all falls apart, I'll think of you. In the meantime, MAKE HAY! Two years later and two thousand new $10 million wells and production is still around 90 bpd while the producers are showing large negative cash flows and lots of new debt on the books. I would say that my view has been proven to be correct. It seems clear that the $20 billion could have been used in a more effective manner. Why is it strange? It is not like it is their money that they are investing. Have you looked at the growth of debt and the cash flow statements? They look terrible but the CEO and senior management is still getting well paid. Getting paid seems to be better than the alternative. @Craig Howard, re "hard to imagine that so many companies have been willing -- over so many years -- to commit capital to such a foolish endeavor." Two years later and two thousand new $10 million wells and production is still around 90 bpd ..."
No, fool. 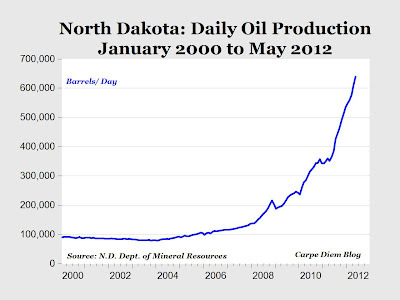 In May 2010 the average North Dakota well produced 69 barrels/day. It's now a third more at 92 barrels per day. 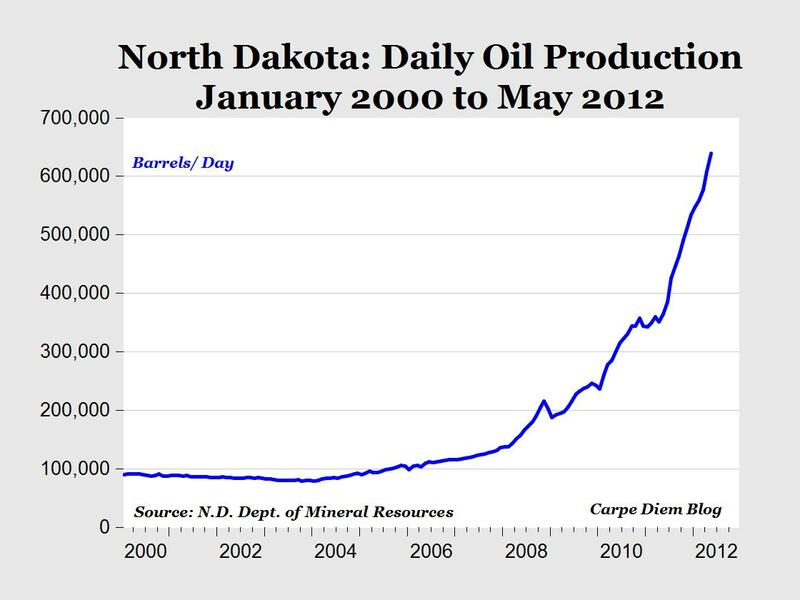 In May 2010 you were bragging that the average ND well only produced 59 barrels/day. It's now more than 50% above that, and you seem to have conveniently forgotten that you bragged about such low numbers two years ago. "That is the problem. By the time the Bakken gets to a high production rate, it will not be producing enough barrels to offset the depletion from conventional domestic sources." Pity poor Vangel, as US domestic oil production is at its highest since 1998. I wonder what it's like being consistently wrong for over 2 years running (and likely more)? It still does not matter because the math and the accounting support my view and not yours. If you have a decent IP drilling 2000 new wells helps you get the rate up. The problem is that the depletion has already taken the production of the 2010 wells down to around 100 bpd, which is why the average well production is as low as it is. What you and Mark are also missing is the capping of older wells that are no longer in production. Even when you take them out of the picture, and I would guess that you are looking at the idling of about two to three hundred per year, the average does not improve by very much. But where the results matter are on the cash flow and balance sheets. And when we look at them we see lots of negative cash flows and an explosion of debt, asset sales, and equity dilution. That is not a picture of a healthy industry. As for the 'record production', it is quite unremarkable. When you invest $20 billion in two years you expect an increase. But given the depletion rate the current production rate is not sustainable unless you spend several billion each year since each year of depletion takes several hundred barrels of production out of the process stream. If you want to understand look at the accounting and learn some math. ... so many companies have been willing -- over so many years -- to commit capital to such a foolish endeavor. I guess you've never heard of things like the dot com mess. Cool. At least one company can read their own balance sheet and cash flow statement. What gets to me is how easily people fall for anonymous promoters who are so bad at math. Look at Mark's data and see what is going on. In May 2009 production stood at 205,995 barrels per day from 4135 wells. By May 2012 production went up to 639,277 from 6954 wells. Even if we assume that there were only 2819 wells drilled, meaning that there were no wells capped and abandoned you are still looking at only 153 barrels per well. Of course, the charlatans tend to ignore the actual wells drilled and somehow fail to determine how many wells were capped and abandoned just to get the numbers to look good. The problem is that in order to get the number up to 1 mbpd, a number that Mark has touted in the past, you are going to need at least another $23 billion in new investment. Once the peak is reached the production rate would fall to 350,000 bpd in a single year in the absence of new wells. The charlatans are playing the same tune again and the unthinking masses and the foolish academics are falling for it. Precisely, and its actually and seriously pretty sad. I'd bet that virtually all of them know that famous quote about suckers from P.T. Barnum, and many got creamed by dot com 12 years ago and the financial crisis 4-5 years ago... and still haven't learned to spot the indicators. And before somebody spouts off, I don't believe that either one of us are against the US becoming more energy independent or that we believe that there do exist some people that are making money via fracking etc. It is, hopefully this time, a time of "peak ideologies". Unless we're talking about a "different" Occidental, "OXY" did not pull out in March. It is still drilling and getting new permits. Also, I'm not aware that OXY was the first major to drill in the Bakken. By any measure, the Bakken has been an outstanding success. But credit VangelV: she is correct: $20 billion could be spent much more effectively if US govt didn't regulate redundantly. Vange may be making good points, from the investors' viewpoint. But, wells will produce as long as marginal costs are exceeded by marginal revenues. So basically, even wells which do not return capital will still produce. Few producing wells will be capped. Also, people are getting better at this shale drilling. They always do. Someone may figure out a way to drill more cheaply or revive old wells through re-fracking or who knows what? Lastly, Oxy has started drilling for shale oil in CA, claiming a $2 million well generates $12 million in revenues in year one. CA shale oil deposits dwarf all other states combined. North Dakota may loom large Perry's mind now, but in 10 years Perry will be agog at CA. The problem is the depletion. You will have the wells of bankrupt companies still producing but without the economics being right the lack of adequate drilling will mean that production will fall off a cliff. Ten thousand wells producing 35 bpd will still give you 350,000 bpd but such wells tend to be capped and abandoned very quickly because the numbers will include some that are not producing enough to justify operating them and the production from those that produce more tends to fall off more rapidly in nominal terms. Shale drilling is not exactly a new process and the demand to offset depletion puts upward pressure on the cost side. And re-fracking is not new either. And it certainly is not very cheap. In fact, I keep hearing about problems in the supply chain as all those very skilled people who are needed to make the rigs are close to retirement and there aren't enough new ones who are as productive to take their place. The saving grace could be a fall in steel prices but that tends to fall together with the price of oil. Essentially, the energy return is what drives the economics and that does not seem to be negative for the AVERAGE well in the AVERAGE formation. The problem for the optimists is that they are counting on production that is outside of the core areas. As I have written before, my geologist friends are much more positive on the core areas in CA than in ND. But I don't see a huge amount of activity because of the political situation in CA. By the time CA production begins to make a meaningful impact I imagine that we will be seeing a decline in onshore Texas and ND. Any production increases in the US will take a lot of investment that cannot be justified given the EROEI. I believe that it is a private company that does not file reports with the SEC. If it does operate strictly in core areas and its lease costs are reasonable it may be cash flow positive. But I have no clue because I do not have the information available to make a call one way or another. So Bakken oil production first reached 145 barrels per day per well in June 2010 with 1663 wells. Today Bakken production is 144 barrels per day per well with 3983 wells. Holy crap, help me out with the math. Isn't that more than a 50% well decline rate in the first year of production? It looks to me like, once you subtract the production from the wells brought online in May (216*800/2) the remaining wells' production declined by about 9%, and that's just in One Month. One of the funniest things I have ever seen is the above Bakken Forum on a Peak Oil website. It has been fun over the years to watch the "Peak Oilers" continually move the goalposts as the Bakken develops. IE a while back it was "The Bakken will never produce 300,000 a day so it doesn't matter" then "It will never produce 400K so it doesn't matter" etc, etc. FTR-I have seen "Vange" mentioned over there-but I have never seen a post by him in my limited perusal of the site. The web site shows that the company is active in a number of areas, not just the Bakken. And if you have a link to the SEC filings I have no trouble looking at the information. Sorry to get a bit detailed here but 650K bpd from 7,000 wells comes out to a lot less than 144 bpd. Mark is using the total ND production while you are looking at the Bakken only. I think that the source that you are quoting has stripped out some of the older horizontal wells, which may be perfectly legitimate. But it does not provide data for how many wells were dry or capped and abandoned. Accounting for the cost of those wells is important if you are going to figure out the returns. And once again, which of the Bakken companies is not adding debt and showing large negative cash flows again? I have looked at a pile of them and have yet to see results that interest me as an investor. That said, the point is valid. The IP in the Bakken for a typical well is much more than 140 bpd. If adding so many wells fails to get the average production rate up by very much it shows just how big of a problem the depletion rate really is. I believe that the numbers that I see are talking mostly about a 65% depletion rate but that tends to be distorted by the cherry picking that goes on when the lowest hanging fruit is picked first. If you throw enough money at the Bakken you get get 1 million bpd. But that is not the argument. The argument is about making a profit and being able to sustain production. There is no evidence of either that I have been able to find in the industry data. If the N.D. wells could produce as much oil as Vange produces gas, it would be really be a boom in oil production.